Use of our squash court is included in your membership at Moorgate. Squash is an excellent way to get an effective cardiovascular workout, regardless of your ability, gender, age or fitness. Being an indoor sport means that you can play year-round, whatever the British weather brings. We have one court available to hire. Members can book a court for a 45 or 90-minute session. Courts are available to book up to 7 days in advance. 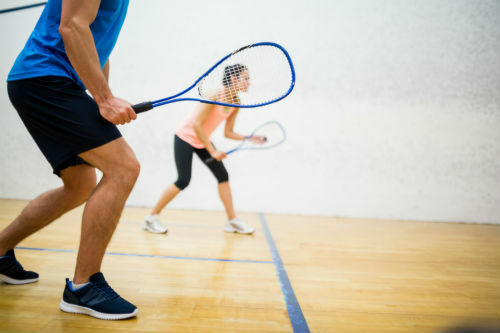 Squash courts are free to hire for members throughout the day during the club’s opening hours. Please book at reception, give us a call or email us. You can hire a racket for £3 each visit. We sell squash balls at £3.50 per ball. We are unable to lend or hire squash balls. A great way to relieve stress and tension.